This article was written by Nathalie, a friend who went to this guesthouse. 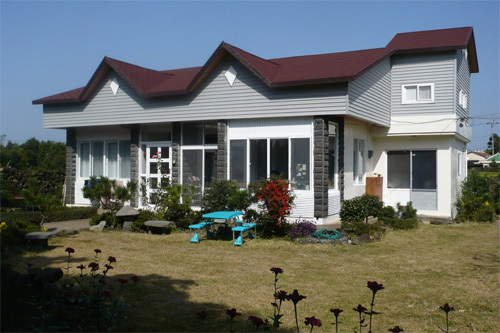 This guesthouse is located in the South West of Jeju’s Island. It is a very friendly modern house with a garden (and well-decorated!). The welcome is warm and you can meet foreigners as well as Korean people on holidays. Free services include breakfast (coffee, tea, homemade bread, marmalade), little bar, washing machine, kitchen, bike rental, etc. Toilets and bathrooms are coed, and so are the dormitories composed by around 8 beds per room. There is also a double room for couples. Though the great welcome from a French guy who were working at this guesthouse when I went there, I was quite disappointed by the distance of the guesthouse: you have to take a bus to go to more touristic places and it’s not an easy thing because not many people speak English and all the signs are only in Korean. Haneul’s comment: Wherever the housing you’ll go to is on Jeju’s Island, you’ll have to take the bus to go to the touristic places. Nathalie’s advice is very useful on Jeju’s Island… You should follow it!